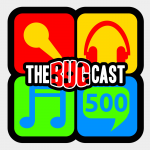 This week on The Bugcast: in our first celebratory special, we invited our listeners to give us their memories of the show over the last 500 shows: many messages, and 7 cracking tracks of Creative Commons and independent music! Thanks to everyone to contributed to this show! Vote for your favourite track of the last year, for episode 503 Listener’s Choice! The next show will be episode 501, Moo’s Choons, which will be streamed live in the chatroom on Friday 16 February 2018 at 21:30-ish UK time (GMT/UTC). I’ve only just caught up with this show. So good, and congratulations getting to 500, sorry it’s a little late.